Maia and I combined our two favorite watercolor techniques last week during Daphne’s naptime. 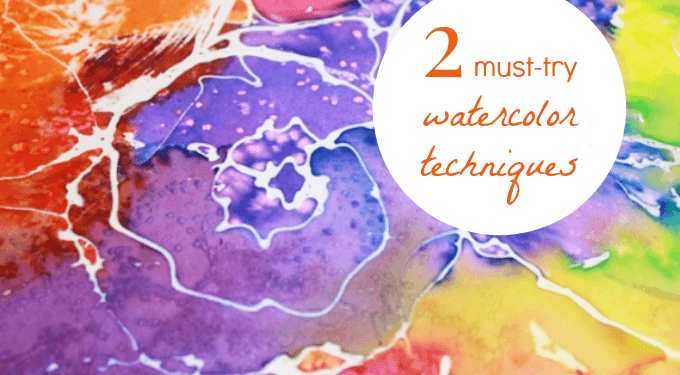 Watercolor resist is one of our all-time favorite techniques to use with watercolors. This time we revisited the rubber cement resist and then sprinkled salt on the wet watercolors. Adding salt is something we like to do with any paint at times, but it really creates beautiful effects with watercolors. onto a sheet of poster board as well as some smaller pieces of watercolor paper. I didn’t take any photos of this step; sorry. I guess I was too busy drizzling. A note about rubber cement :: Use it in a well ventilated area or do it outside. The fumes are not the best to breathe. There are no fumes once it is dry. Then, we sprinkled salt over the wet watercolor paint. Maia was very into this step and would have been even more generous with the salt if we had had more in the house. As it was, she used the last of it. Note: This works best if the salt is sprinkled over very wet watercolors, so do it quickly before the paper absorbs the watercolor paint. , we didn’t have to do it in sections. Here she is, with a paintbrush in one hand and salt in the other. The smaller pieces we did are laying flat on the floor in the background. We didn’t want to hang them on the drying wall for fear the salt would slide off and the watercolors would drip off. Once the watercolor resist painting was finished, we let it dry completely. Here’s a section of the dry painting with the salt and rubber cement still on it. See how the salt creates interesting designs in the paint? The salt crystals soak up the liquid from the watercolor paint, creating areas without as much pigment. To vary the effect, you can use different size salt crystals as well as try it with more or less watercolor paint (ie more or less wet). We mostly used table salt this time, with a little bit of sea salt, but have used the coarser kosher salt as well in the past. Now, here’s a close up of the rubber cement lines. I wanted to show you this, because in the next photos, the rubber cement will have been rubbed off, exposing the bright white paper underneath. To finish the artwork, we first brushed and rubbed the salt off the painting as much as possible with our hands. Then, we used our fingers to rub the rubber cement off the paper. It balls up and comes off as you rub it. It took a while, and because of the salt that was still left on the paper, it wasn’t gentle on our fingers. We shared the task and kept alternating our fingers and thumbs. I would recommend starting with smaller artworks. If you want to do a large posterboard-size artwork, then consider spreading the rubber cement removal task over 2-3 days, doing a little bit at a time. But look! It is so beautiful! We kept exclaiming over how it looked the whole time we were rubbing off the rubber cement. And afterward. , the drizzled white lines from the rubber cement resist, and the mottled texture from the salt. LOVE it. Here’s the big picture. We hung it up in a place of honor in the living room. This is a detail showing the combination of the texture from the salt and the lines from the watercolor resist. Our smaller artworks are hanging on the drying wall, waiting until we’re ready to rub off some more rubber cement. Soon! As art activities go, this one was a big hit. The combination of the two watercolor techniques made for a fun process and a beautiful finished product. What do you think would happen if you combined two of your family’s favorite art techniques? If you try it (and remember, experimenting breeds creativity! ), please share a photo on my facebook page. I would love to see! This is way too fun, Jean! The effect reminds me of batik. I’m feeling a little trapped creatively since we’ve been on vacation, and can’t wait to do more experimentation like this when we get home. These are beautiful! We will have to try this out! Thanks for sharing. Just a reminder to California followers that we are not allowed to use rubber cement with children in a classroom setting. They banned its use a couple of years ago. Sad, but true. I guess I will have to try white or clear glue and not remove it. Thanks, Rachelle! Do you have a sketchbook with you? I imagine there’s a lot you can do on a small scale (if you have the time, that is. I know you have a lot going on). Glad you like it, Eddie! These turned out great. Gonna try it! And the layering idea is fantastic! Oh, I’d love to try this with multiple layers and I’m sure Maia would too! How fun! Let me know how it works with the blue glue. Have you tried using rubber cement outside? Would this technique work on a smaller blank canvas? Its lovely. Would it work if you used white glue instead of rubber cement? My goodness I’ve fallen so behind on reading your blog (life!) and wow – you seem to just have every project recently aimed perfectly for us and what my kids are into at the moment! Thank you so much – your blog is such a valuable tool for ideas and springboards for our creative endeavours! I just discovered your delightful artfulparent.com – so many wonderful ideas to share with my grandchildren. But, I must tell you, as a professional artist just rediscovering watercolors, this article has been amazingly inspiring. I can’t wait to get back into the studio to work . . . oops, scratch that . . . PLAY! Thanks so much for sharing and for the wonderful step by step descriptions and photographs. Each year I have a tea party for my four grand-daughters. For the next one I thought i would call it an Art-tea party. I was looking for ideas using some kind of resist technique and came across your watercolor resist with salt. I think they would really enjoy doing this.I wondered how you got the rubber cement thin enough to drizzel? Would it work on a gessoed board? Hello would this technique work well on canvases too? This is really. Will try this with my daughter’s birthday party in January. I was looking for ideas and I think I can easily do this at home. i am sure girls are going to have fun. I just came across a website called Artbeez where one can showcase, sell kids art work and raise money for charity all together. Thought of sharing this.